Oh, I’m having fun flooding my paper with water and then setting off fireworks with color. 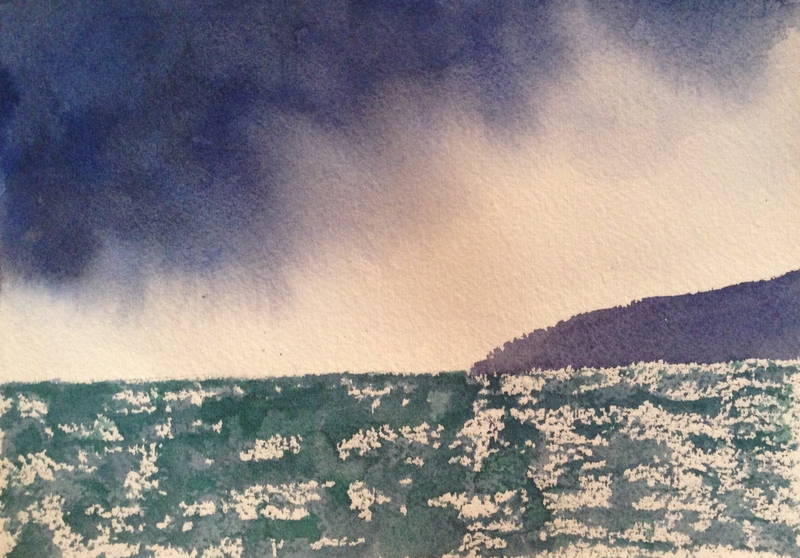 This painting was inspired by tutorials from Birgit O’Connor. I’m very happy that many artists have paved the way before me, and are happy to share their techniques and inspiration. As have many of you reading this right now! I want to thank all of you so kindly for your advice and feedback as I continue sailing forward. Colors (all M. Graham): Viridian, Ultramarine, Burnt Sienna. This one was fun; I really enjoyed it! Did it turn out like I thought? Heck no, but I am learning to love what the medium gives me. It’s hard to go wrong with that attitude. Took awhile to get there, but it was worth the journey! I wish all of you a most creative, enjoyable, relaxing and peaceful weekend ahead. May paint puddles prevail! But this water is beautiful too! And you seem revived this morning as well. LOL! Girls Just Wanna Have Fun..
Get your Cyndi Lauper on lol! supposed to say my creative buddy – not by – GRR! Very dramatic results! I like your technique with the water. Have a great weekend. Thank you, Sharon! Drama is much better in painting than in real life. I hope you have a creative weekend! Cool sky! A “play” approach is fantastic. Thank you so much! I replied earlier, but is see WP took its mighty phaser gun and erased it lol. This is the best comment ever! I so hope that people are inspired to try M Graham paint. It is absolutely wonderful! Those are some great clouds. Very ominous. Thanks! Wet paper, bit of paint, tilt the paper. So easy and fun! I admire your great art. Thank you very kindly; I do appreciate all of your visits and comments. Best of luck to you as well! What a beautiful painting to come back to the blogging world to! I have a book on painting skies by Ron Ranson (I think…at least I used to have it; can’t find it on my shelf just now). I’ve requested the skies book and painting fast and loose from interlibrary loan. They look great on Amazon. Welcome back, Teresa!! Wow I don’t even know what that means! I have so much to learn. I’m glad you’re getting into something that feels good to you! I understand what this is now. Beautiful! Oh I can’t wait to see your animals done this way, if you are thinking of this. Question: is the idea to understand the structure of the animal better, and carry it forward into illustrative work, or are you thinking of drawing your illustrations more in this style? I was told by two different illustrators to continue life drawing every day and applying the knowledge to my illustrations, not necessarily to draw in that classic, formal style. So much to learn and keep learning! No doubt, Teresa! I think that’s why art is so addictive and fun. One of the best things about creating art can be the happy surprises… this one turned out great even if it wasn’t what you expected. Thank you so much for saying so. I really appreciate it! I love the wet-in-wet also. Love the stormy look. Thank you, Teri. I’m really learning to just get out of the way, you know? As much as possible. Aww thanks, Rebecca, I really appreciate you saying so. I’m finding that the more I get out of the way, the better the painting becomes. I still have lots to learn, but this July project is helping a lot. Thanks, Jill! Yeah, all my small pre-torn sheets are gone so I’m going to 5x7s for the moment. We’ll see if they get larger once I have a clue of how to compose a painting. lol. Happy Weekend! Beautiful! It really appears like a storm is rolling in. I can feel the waves raging, the strong winds blowing, and feel the urge to find a safe place to hide until the storm comes to a calm. 🙂 Really do love your sky work. Thank you so much, BB! I’ve been really working hard on skies and now, surf. I hope to work on them both in one small painting tonight. I thought I would never be able to paint skies in watercolor. I do have to let go of the result though. I try never to paint from a photo, but only let one inspire me. Plan B is always the best one in watercolor, I’m finding. It is interesting how Plan A many time doesn’t always work not just in art but in life as well. I look forward to seeing what you created! Surf hasn’t exactly worked out yet, but I’m making progress. I agree; art can teach us so much about life! Haha me too! How far are you now from it? Maybe there’s a nearby lake? No doubt! I enjoy painting it when I can’t be there too. Woods are good! Maybe some streams there? Yes. 😊 Gotta check them out!